Adelina Voutchkova-Kostal, an assistant professor of chemistry, is the recipient of the prestigious National Science Foundation CAREER grant. A young researcher plans to use a sought-after national grant to get more people involved in science policy. Adelina Voutchkova-Kostal, an assistant professor of chemistry, received a prestigious National Science Foundation grant last month. The grant will enable her to conduct research on designing safer chemicals and create educational opportunities in D.C. on the impacts of chemical regulation. The Faculty Early Career Development (CAREER) Program offers the NSF’s most desirable awards for junior faculty who propose a research plan with integration into the classroom and community outreach, according to the NSF website. Voutchkova-Kostal said this grant – which begins in February and continues for five years – differs from regular NSF grants because it requires applicants to create plans on teaching and other aspects that aren’t typically included in research proposals. As national research funding becomes more competitive, younger researchers have generally struggled to get grants, an obstacle this program could help to alleviate. “They support young faculty in their first four or five years of their careers with special grants that are larger in size and longer in duration,” she said. 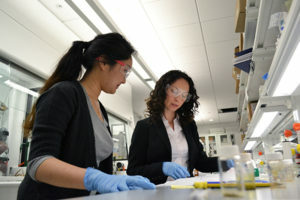 Voutchkova-Kostal said her research will work to reduce the use of toxic chemicals by developing a recyclable catalyst. Voutchkova-Kostal said that she and her team are proposing to turn two waste streams into useful industrial chemicals. She added that she has three graduate students and four undergraduate students working on her research team who have helped her on the preliminary studies she used to develop the proposal. Adelina Voutchkova works alongside senior Hannah Yi, a chemistry major. “We are lucky to have a lot of interest from undergraduates to do research in our lab and that has contributed significantly to our ability to do the preliminary research needed to get the results that would help us secure the grant,” she said. She added that she is also creating new research-based organic chemistry labs for undergraduate students, who generally don’t get as many chances to conduct research as graduate and higher level students. “We are doing cool things on the teaching front like having some of the students in the organic class actually work on some small research projects so they get a taste for what it is like to actually do research within the context of the lab,” Voutchkova-Kostal said. Voutchkova-Kostal said the grant opens doors for continued funding for the research, and allows the researchers to be eligible for future funding for their projects. Michael King, the chair of the chemistry department, said in an email that department members were thrilled that Voutchkova-Kostal was selected for the prestigious grant and that this grant will enhance the green chemistry program. “Professor Voutchkova-Kostal will now use the grant to grow her green chemistry research and outreach programs, further enhancing the opportunities for our new master’s degree in environmental and green chemistry,” King said. 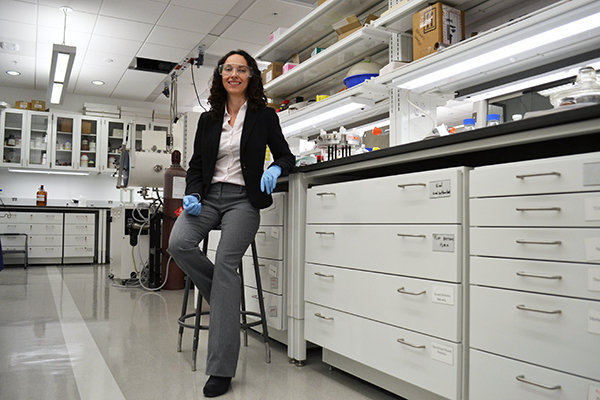 Voutchkova-Kostal said that she collaborated with the chemistry department, the Milken Institute School of Public Health and the Center for International Science and Technology Policy in the Elliott School of International Affairs to develop “green chemistry symposiums” that will open up her research to the general public. She said she hopes to open a dialogue between scientists, lawmakers and those in public health fields to discuss topics like fracking and chemical production regulations. The plans for the symposiums are in still in development, but it will likely be held on campus three times a semester.